Now let's add a little color to our program. We'll start with the code from the previous lesson, with some of the comments removed. 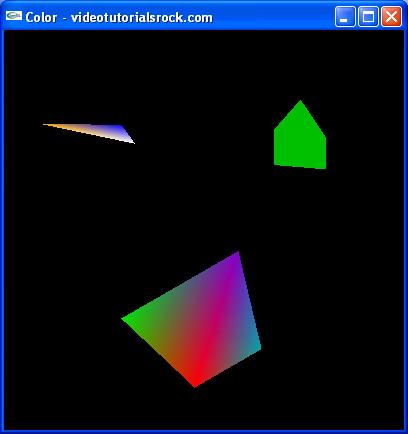 First, we add glEnable(GL_COLOR_MATERIAL) to the end of initRendering, in order to enable colors. Let's make a couple of changes to drawScene. After we make these changes, our program looks like this. The changes are simple enough. We just added two calls to glColor3f. Whenever we call glColor3f, we change the current color to the indicated RGB color. Everything we draw afterwards is drawn using the new current color. 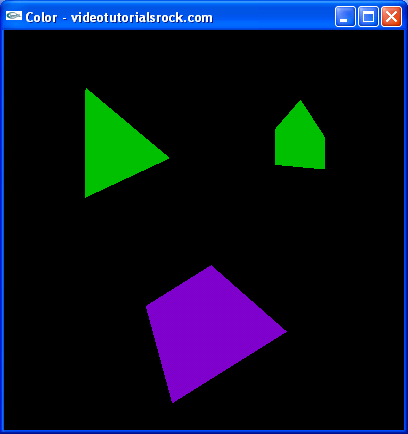 RGB is a very common way to represent colors on computers. Using the RGB system, we specify each color as a combination of red, blue, and green light components, where each component ranges from 0 to 1. If you're not familiar with RGB, I recommend that you look it up online and become familiar with it. Note that unlike with transformation functions, we can can glColor3f between glBegin-glEnd blocks; this is what we do in the second call to glColor3f. Pretty cool, huh? 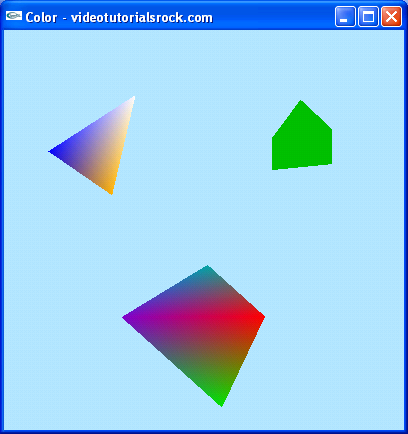 We can use a different color for each vertex, and OpenGL will automatically blend smoothly between the colors of the different vertices. That's it! Adding color is pretty straightforward.